Getting robots to do things isn’t easy: usually scientists have to either explicitly program them or get them to understand how humans communicate via language. By monitoring brain activity, the system can detect in real time if a person notices an error as a robot does a task. 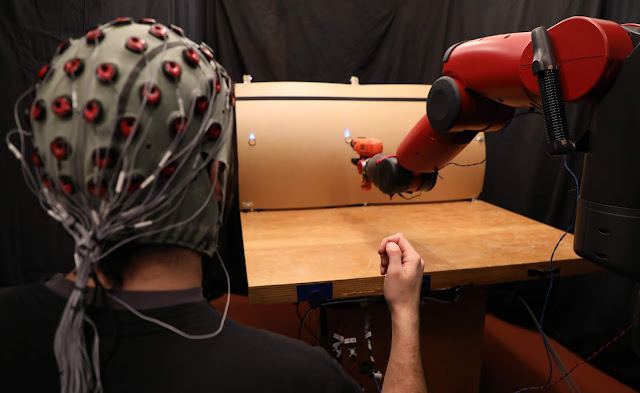 Using an interface that measures muscle activity, the person can then make hand gestures to scroll through and select the correct option for the robot to execute. PhD candidate Joseph DelPreto was lead author on a paper about the project alongside Rus, former CSAIL postdoctoral associate Andres F. Salazar-Gomez, former CSAIL research scientist Stephanie Gil, research scholar Ramin M. Hasani, and Boston University professor Frank H. Guenther. The paper will be presented at the Robotics: Science and Systems (RSS) conference taking place in Pittsburgh next week. In most previous work, systems could generally only recognize brain signals when people trained themselves to “think” in very specific but arbitrary ways and when the system was trained on such signals. For instance, a human operator might have to look at different light displays that correspond to different robot tasks during a training session. Not surprisingly, such approaches are difficult for people to handle reliably, especially if they work in fields like construction or navigation that already require intense concentration.Meanwhile, Rus’ team harnessed the power of brain signals called “error-related potentials” (ErrPs), which researchers have found to naturally occur when people notice mistakes. If there’s an ErrP, the system stops so the user can correct it; if not, it carries on. For the project the team used “Baxter”, a humanoid robot from Rethink Robotics. With human supervision, the robot went from choosing the correct target 70 percent of the time to more than 97 percent of the time. To create the system the team harnessed the power of electroencephalography (EEG) for brain activity and electromyography (EMG) for muscle activity, putting a series of electrodes on the users’ scalp and forearm. Both metrics have some individual shortcomings: EEG signals are not always reliably detectable, while EMG signals can sometimes be difficult to map to motions that are any more specific than “move left or right.” Merging the two, however, allows for more robust bio-sensing and makes it possible for the system to work on new users without training. The team says that they could imagine the system one day being useful for the elderly, or workers with language disorders or limited mobility.